Glad your spring has finally arrived our winter was late too but the nights are now cool. I am always so happy when spring arrives. I love your pretty violas and the colors of the primrose are beautiful. My favorite flower is the daffodil. Ours have come and gone so please share pics of yours when they bloom. I love their little heads bobbing in the breeze. Happy Spring! Yes, it's finally spring!!! Your garden is taking shape, and of course, you know I love your primrose!!! Oh so pretty! Hi Liz! I can just imagine that you must truly be celebrating the arrival of spring with the winter you have. It has been spring here in Texas for awhile...in fact it was 88 degrees today. In the blink of an eye you'll have green grass and flowers galore. hoe nice, spring has sprung. Your garden is shaping up beautifully and will be in full bloom before you know it. Always a pleasure to visit and see your lovely gardens. I have never grown primrose. Yours is lovely. I would love to come sit with you in your garden - everything looks wonderful. Liz, There's nothing more cheery and welcoming than a pot of violas! I'm heading to the garden center today and am digging in the dirt. Enjoy your spring! I'm glad you're finally getting Spring, Liz! It is warmer and rainy here in Michigan. I went to buy plants yesterday and the sales lady said we're not safe from frost until Memorial Day! I'm going to go ahead a plant in pots and bring them in if it gets cold. I am envying all the beautiful gardens! Don't you just feel more energetic when Spring finally gets here?! I'm so happy you're having warmer weather and your beautiful garden is waking up. Love your violas! I bought 2 hanging baskets of them for half price at Walmart. They look great! I had no idea primroses came back! 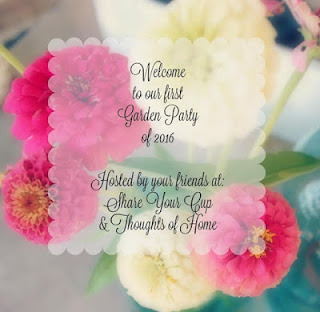 Thank you so much for linking up to the Garden Party. Your garden is completely enchanting! Hi Liz, glad you finally are getting spring! You have had quite a few snow storms. I buy primroses for my porch pots every spring. When I plant my summer annuals I replant the primroses in my garden in a shady spot. I have had pretty good luck with them coming back. Thanks for sharing with the Garden party. So lovely to see all that spring is bringing to your garden! I love your gardens and your primrose come back year after year??? They die in the Texas heat, in fact I am carefully pampering one that I have in a pot that I bought way back in February. Oh I could hear the Violas calling your name and I am so thankful you succumbed to them. I could not resist them either and I am so glad that you didn't! We have bunnies all around us too-one was sitting on the front porch this morning like a cat! Glad spring has arrived in your neck of the world!! Love..love...love your flowers! They just scream "spring"! I have spent 3 days at garden centers and farms and Lowes buying flowers, perennials, hanging baskets etc. and almost all are ploanted. We had several WARM days, (yesterday was 85 ) for crying out lous. Now we are back to 60's and 50's Thurs. and Fri.:( Your gardens are always a delight to see. I am glad Spring has finally sprung at your house too!!!! Your flowers are so pretty. I have not started planting yet as we still have cold evenings and mornings here. I am going to wait until May to start mine. Enjoy the week. Your yard is beautiful, very soon everything will be green and in full bloom! It's happening here, very slowly, but it is nice to see everything coming back to life! Just discovered your blog and I am blown away by your gardens, I wish I could be half as good as you, I just very basic in gardening! Have a fabulous weekend.